Why are young Asian girls invisible when it comes to Eating Disorders? When I think of an eating disorder, the first thing that comes to mind is the image of a young white girl who is painfully thin. The word anorexia has become synonymous with eating disorders as are the emaciated images of anorexic girls who are most likely to be white. Given the negative reporting around eating disorders and the relentless pressure on young girls to conform to a particular body image, I can be forgiven for this inbuilt conditioning and stereotyping. This week is Eating Disorders Awareness Week, which is a campaign to raise awareness of the complexity of eating disorders as well as challenge these very stereotypes and stigmas. So I’m writing this to dispel the myth that eating disorders like anorexia and bulimia are illnesses that only happen to white people. Young South Asian girls also suffer from eating disorders. Some research indicates that in particular young Muslim girls of South Asian origin in the UK are particularly at high risk of developing bulimia. However, as a simple google search reveals, mainstream media coverage would leave you thinking that ethnic minorities hardly suffer from eating disorders, leave alone the fact that some groups may be at high risk. This stereotype is also prevalent amongst South Asian communities, in which mental health issues are often swept under the carpet as sufferers are stigmatised. The result is that young South Asian girls, and in particular young Muslims, are being overlooked by mainstream agencies when it comes to recognising their suffering, and getting them the help and support they need. We know that in our society there is huge cultural pressure on young people and in particular girls to be skinny, waif like and attain impossible barbie like body shapes. 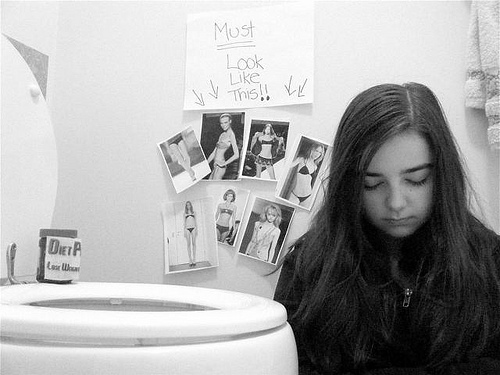 The gendered link between media pressure and eating disorders is inescapable. But frustratingly just as women from ethnic minorities are absent from everyday media appearances, the fact that they too are also subjected to the same cultural pressures and resultant illnesses, is also absent. We need to recognise that young South Asian girls are just like any other young girl in the UK, and we can do this by bringing their experiences to the forefront of discourses on issues such as eating disorders. In doing so we can then validate their identity, needs and raise awareness of the difficulties they face. Yes, their culture and faith background may impact on the way they experience particular issues, but the point is that the actual issues are the same for any young person in the UK, irrespective of their ethnicity. Anorexia and bulimia are savage illnesses – anorexia in particular has a high mortality rate, with 20% of sufferers dying prematurely from the illness. So it is vital that every young girl at risk of developing an eating disorder receives treatment and help quickly, which means recognising when they are in the early stages of the illness. However in the past I have come across startling prejudice when it comes to young South Asian girls and eating disorders, preventing them from getting the help they need – one health professional thought that Asians wouldn’t suffer with anorexia given “their diet of samosas and fried food”. This is just one example of a stereotype attached to South Asians. Unfortunately in my experience, young Muslims also often report feeling misunderstood by mainstream services. This is because implicit prejudice can colour blind health professionals from recognising disorders such as bulimia in their Muslim clients. Charities like beat are doing amazing work to raise awareness of eating disorders and challenge stereotypes. We now need to take this further and recognise the devastating affect eating disorders are also having on young South Asian women. I hope all is well with you. Healthline just published an infographic detailing the effects on the body of Bulimia. This is an interactive chart allowing the reader to pick the side effect they want to learn more about. I would really appreciate if you could review our request and consider adding this visual representation of the effects of bulimia to your site or sharing it on your social media feeds.